Going … Going … Gone. But Never Forgotten. As so often happens, once you open your heart and fall madly in love, the object of your desire is cruelly yanked away and you’re left only with the crumbs of passion and teasing reminders of happier times. Not that I’m comparing the loss of Mellow Mushroom‘s seasonal Homegrown Harvest Pie & Drunken Fun Guys & other yummy menu items to an intense but doomed love affair … oh, wait … that’s exactly what it is. 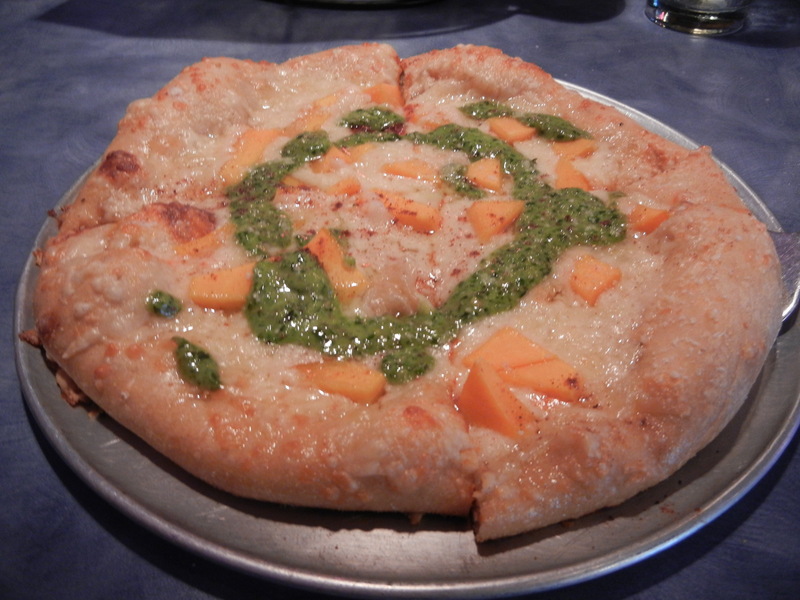 Mellow Mushroom craftily got us hooked on this absolutely delicious pizza, made with nutmeg-seasoned roasted butternut squash nutmeg on an olive oil and garlic base & topped with parmesan and Montamore cheeses and a swirl of Arugula pesto. And then there were the Drunken Fun Guys — little pillows of pizza dough served with three beer-infused sauces: a spicy cheese dip with Abita Turbodog brown ale, a stout and honey glaze and a Rouge Dead Guy ale spicy mustard. And there there were the Magic Mushroom Soup and Holy Shiitake Pie — also gone but never forgotten. I only mention these now-unattainable treasures because 1) I’m fascinated with how Mellow Mushroom has merged a successful capitalistic business plan with its counter-culture too-cool-to-care laid-back attitude, 2) maybe you’ll be inspired to try to recreate these taste treats at home and 3) maybe the next round of limited-time offerings will be just as good. Fingers crossed. This entry was posted in Alabama, food and tagged Alabama, Butternut squash, cooking, eating out, food, home, Huntsville, Mellow Mushroom, menus, Olive oil, pizza, restaurants by Coffee with Cathy. Bookmark the permalink.